A Formula 1® pit stop is much more than just stopping, changing tires and accelerating away. Perfect planning and absolute precision at breath taking speed are needed to get it right first time. Pit stops are possible the most visual evidence of why a Formula 1® is a team sport. Red Bull Racing are still the ones to beat in the DHL Fastest Pit Stop Award. For the third time this season, the Bulls were fastest at changing tires in the Chinese GP, the 1,000th Grand Prix in F1 history, and comfortably lead the DHL Fastest Pit Stop Award. Max Verstappen was fitted with fresh tires in 2.15 seconds in the fastest pit stop of the season so far. The second-fastest stop of the race in China was also performed by Red Bull's crew, who turned around Verstappen's team-mate, Pierre Gasly, and sent him back out in 2.19 seconds. The young Frenchman also secured the DHL Fastest Lap for the first time in his career. While Red Bull Racing were responsible for the fastest stops in this special anniversary GP, Mercedes completed the most spectacular pit stops of the race. The Silver Arrows made a double stop on Lap 36, changing tires first for eventual race winner Lewis Hamilton (3.24 seconds), and then immediately afterwards for teammate, Valtteri Bottas (3.05 seconds), who finished second. "It was an interesting situation. It was clear that Valtteri in that situation was under pressure from Sebastian [Vettel]. If Sebastian would have stopped he would have undercut Valtteri so the logic choice is to stop Valtteri first but if we would have stopped Valtteri he would have undercut Lewis. So we didn't want to interfere with the order and that is why we decided to stack," said Mercedes Team Principal, Toto Wolff. "We knew that we were just about to have the gap to stack them properly we gave the commitment to Valtteri that he wouldn't lose any time. It was really impressive how the guys did it. It was the choreography for everybody who understands F1 it was really impressive. It came so far that even Dieter Zetsche called all the mechanics together and said he hasn't seen anything like this before and congratulations." Teams used a two-stop strategy, as in the previous race in Bahrain, giving a total of 36 stops, 14 of which lasted less than three seconds. Red Bull Racing took the top four times, which goes to show that they are currently on impressive form when changing tires. Select up to three teams. 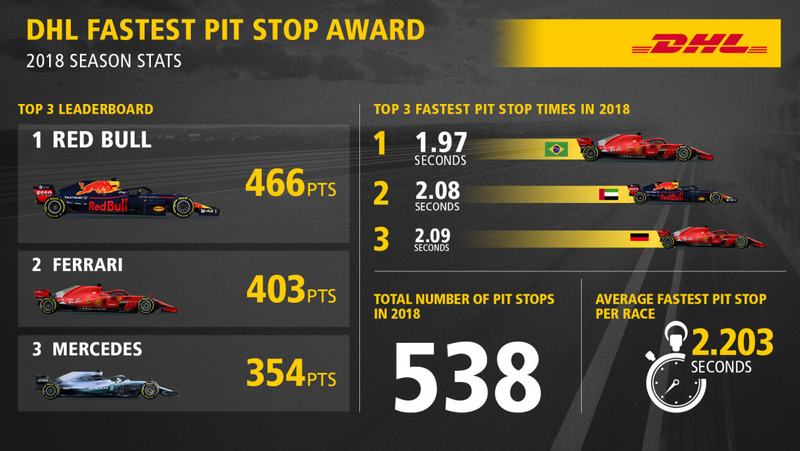 All the stats, facts and figures for the 2018 DHL Fastest Pit Stop Award.